You’re a small business. You need help with communications and public relations and would love to tap the strategic brilliance of PR agency veterans. However, you’ve heard that separating the wheat from the chaff in PR agencies is tough, plus, your budget almost ensures you’ll get low priority attention from an agency’s junior team. What to do? There are some excellent PR firms, but it’s the horror stories, especially about well-known agencies, that serve to make an important point about successful public relations. In 2007, Chris Anderson said it best with his post, “Sorry PR People: you’re blocked”. In a move viewed as extreme by some, Anderson published a list of 300 PR people who were officially blocked for bad behavior. He described in detail, “… lazy flacks send press releases to the Editor in Chief of Wired because they can't be bothered to find out who on my staff, if anyone, might actually be interested in what they're pitching.” Anderson gave us all a view from the shoes of a writer who stares down the fire hose of pitches every day. To make matters worse, the supposed professionals at the agencies who should have known better were routinely sending generic spam. Because this has become the norm rather than the exception, many journalists prefer hearing directly from the source, not an agency. The most memorable post I’ve read on DIY PR was this one by Glenn Kelman, CEO of Redfin. Kelman wrote this also in 2007, just before social media really burst on the scene as a ‘must do’ for communications. And guess what? None of the foundational principles have changed. In the post, Kelman reminds us to tell the truth, to provide good ideas and to remember that the rolodex is already online. It’s a great read for entrepreneurs who want to start telling their story in a meaningful way. In addition to some of the things Kelman highlights, we have seen new offerings from the social media landscape. Things like Peter Shankman’s Help a Reporter Out site which connects journalists/bloggers with resources in a variety of communities. I think he has 100,000 subscribers at his last count. And it’s still growing. And Shankman builds the kind of communications environment we want to see – reporters flock to his site in part because he bans anyone who spams and has clear guidelines for what a ‘good’ pitch is. Generic messaging and information overload from so many sources are some of the reasons why I believe Twitter is emerging as a very effective tool for journalist and blogger relations. It’s a win for the journalist or blogger because they can quickly sift through a sea of inbound pitches. If you can’t tell them something interesting in 140 characters, then you’ve lost a shot at any more air time. There’s also an opportunity to provide value, resources and interesting information (even when it’s delivery doesn’t directly benefit your company) to your target journalists via a medium that is quick and useful. The more you help the a journalist in their efforts, the more you become a trusted resource for when you do need them to write about you. Let’s just call it relationship building via text message vs. long, awkward voice mails. A little more efficient for both sides. So, if you’re an entrepreneur that finds this interesting and believes in the Shankman and Kelman principles of meaningful communications with journalists and bloggers, then read on. If you still think spamming your news release is the way to go, then please go elsewhere. This list is not for you. As a small business owner who does believe in DIY PR, I wanted to help my fellow small business colleagues take advantage of the brevity of the Twitter medium for delivering interesting information to journalists. Compiling that kind of information can be extremely time consuming, so I used Smartsourcing (Smartsheet + Mechanical Turk) to do it for me. 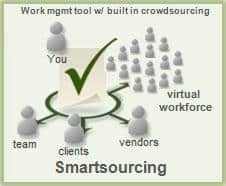 Think of it as a project management tool with workers included. They log on and get things done for me and I pay them anywhere from 0.05 to 1.00 per task. It cost $68. Here is the final list. If this list is beneficial to you, add to it, or edit things you find are wrong. Together we can build a very useful tool for all of us at no cost. This is a live list, so things you add or delete affect all of us. My bet is, the people using this will do so constructively. **All of the emails and Twitter aliases on this list were available via the journalist's bio page, web site or personal blog. This information was all publicly available and was not harvested from any contact or list.